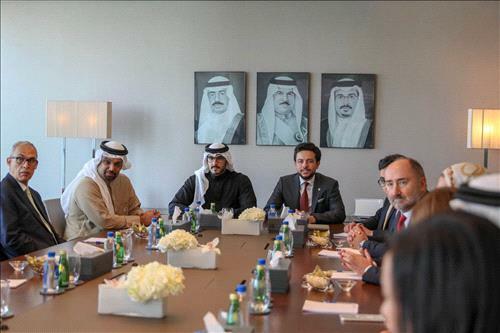 AMMONNEWS - His Royal Highness Crown Prince Hussein on Wednesday visited the Bahraini Economic Development Board (EDB), where he looked firsthand at the duties of its departments and divisions. EDB Chief Executive, Khalid Rumaihi, briefed the Crown Prince on Bahrain's experience in the field of promoting economic growth and attracting investments, as well as the board's role in incentivizing the private sector and the facilitations it is providing to investors, in addition to reviewing the "promising" investment opportunities in Bahrain. During the visit, the Crown Prince lauded EDB's entrepreneurial role in supporting Bahrain's small and medium sized firms, empowering youth and supporting their projects, underlining the importance of exchanging expertise between the two brotherly countries. The Crown Prince also reviewed the most prominent top priority projects that will be implemented over the next five years in the oil and gas, tourism, transportation, logistics, information and communications technology, manufacturing industries, and financial services sectors. Established in 2000, Bahrain's Economic Development Board (EDB) is a public body responsible for attracting foreign investment to the country and supporting initiatives that help enhance the investment environment. The Board's role lies in working with the government and current and future investors to ensure the attractiveness of the investment environment.